Spring is gently giving winter the heave-ho and we can start to think about warmer weather and wearing leather. That also means digging out the sports boots and putting away the waterproof wellies. These are our picks of the sub-£200 sports boots available right now on the MCN Shop, where you can find hundreds of pairs of boots and a range of thousands of motorcycling products. Go to www.mcnshop.com to see more. Sporty boots from long-standing manufacturer Prexport, with a synthetic leather upper, plastic protection around shins, ankles, heels and calves and padding on the outside of the ankle, plus comfort padding on the inner ankle and shin. They open by zip and Velcro and had gear shifter pads and replaceable toesliders. 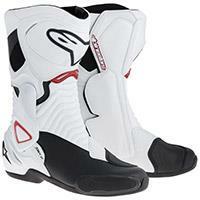 Sports-touring boot from race specialists Alpinestars have plastic cups to protect the heels, ankles and shins and have padding around the top of the boot for comfort when worn under jeans or textile kit. There are gearchange pads, a flex zone around the join from foot to ankle, a zip/Velcro closure and removable toesliders. 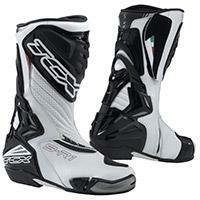 Race boots with dual-density rubber soles with reinforced arches, a synthetic leather supper and protection against crushing for the toes and an articulation system to reduce sudden ankle flex. There’s an air-tech lining to help the rider stay cool, replaceable toesliders and the boots use aluminium buckle closures. 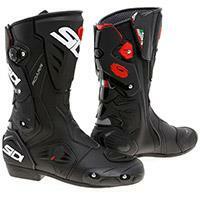 Sidi’s new-for-2015 boots are designed for those who want the comfort of a touring boot and the performance of a track boot. They’re made from synthetic leather with a Teflon-coated mesh inner to boost comfort, an anti-twist ankle support and a shock-absorbing heel cup and replaceable plastic toesliders. 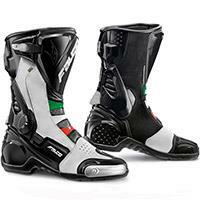 Sturdy and reassuring racing boots with TCX’s Torsion Control System (TCS) to brace the ankle if the rider falls, but while allowing enough flexibility to operate the bike’s controls easily and also to walk comfortably. 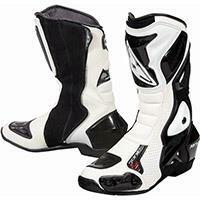 There’s plastic protection around the shin and the foot by the gearlever and replaceable alloy toesliders.